Get your best buddies around for a movie marathon and before you can hit "play" they're all going to want access to your Wi-Fi. This is the age of the second screen experience after all. You could simply tell them your network's name and password, but here are a couple of alternatives that might be more convenient and add to your geek credentials at the same time. We're talking about NFC tags and QR codes here, so obviously this is only going to work with compatible Android handsets. Anyone who turns up at your house with an iPhone is just going to have to take the old-fashioned route or make do with a cellular connection (which may well be faster than your broadband anyway). InstaWifi is a great little utility that enables you to offer your friends a couple of ways of getting connected. The first and perhaps the most straightforward is the QR code method. Switch to the QR tab, tap out your network details and password, and a code is automatically created. Export this somewhere with the Share button to print it out (the exported file is a JPEG though InstaWifi may neglect to add the extension). Stick the printed code to your wall (if you can stomach it) and people can log in as they enter your house. All they need is a QR code scanner like this one installed and they can start surfing straight away. You could even attach one of these barcodes to your next party invitation to save you the hassle of giving everyone the Wi-Fi network and password details separately. QR codes may be fine for the tech-savvy members of your friend group but NFC tags can be even more impressive (and way less hideous). Pick up a batch of rewriteable NFC tags—you won't need to spend much—and again InstaWifi has you covered. Just enter your network information then tap Write to Tag (with the tag in close proximity) to complete the job. Anyone with an NFC-equipped Android phone can then simply tap the tag as they walk by to get connected, so stick it somewhere prominent. There is a catch though—they'll need InstaWifi installed to get connected. If it isn't detected, the tag will link to the app in the Google Play Store, so the setup process is fairly straightforward. Alas, Android doesn't yet have the ability to recognize and apply Wi-Fi settings directly from an NFC tag. If you don't want your guests to have to install any extra software at all, then another option is to write the password to a tag as a plain text string—this then pops up on the user's phone when the tag is tapped. It'll need to be something memorable, as your guests will have to type it manually in on the login screen. 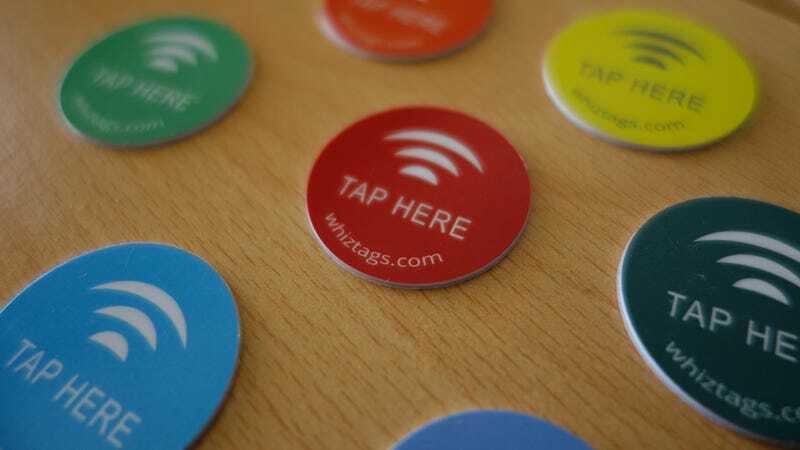 At this stage you're probably thinking it's easier to just tell everyone what the password is, but an NFC tag can be useful for bars or cafes when you don't necessarily want a password displayed publicly but want to make it straightforward for anyone to bring it up. A variety of tools can help here, but NFC Writer is one of the neatest we've come across (check out Trigger by the same developer to really get creative with your NFC tagging exploits). From the front screen choose Additional Tag Types then Text to enter your password. You'll then be prompted to place the tag next to your Android device to write the data. Each of these methods has a hitch or two that might put you off, but it's a cool little project to try and you'll discover all kinds of other uses for NFC tags along the way, from Foursquare check-ins to website URLs—we'll take a look at some of these in future guides. In the meantime, enjoy (hopefully) never having to say your Wi-Fi password out loud again.